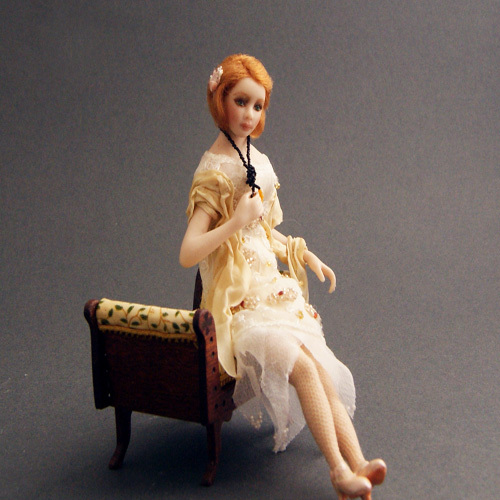 Bernice – is from the 1930’s. She is ready for a night out in her daring shorter dress embellished with tiny beads and a shear silk hemline. Her shawl is made from China silk with the hand strung bead necklace completing the look. The hair is made from viscose and styled in the period finished with a floral pin. Undergarments/tights and shoes are worn. 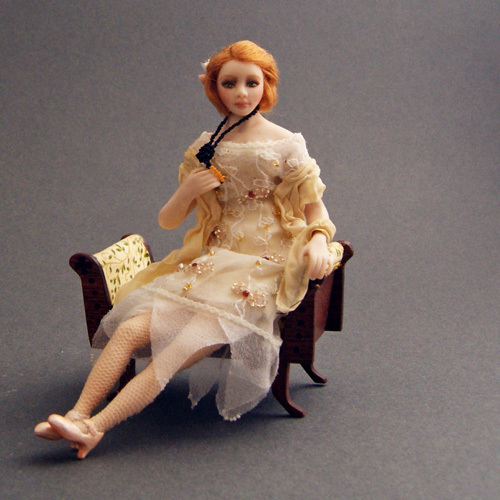 Bernice will stand or sit and is made from porcelain with a soft body - 1/12th scale (5½″ approx.) i.e. Dolls house size. PLEASE NOTE THE SEAT IS NOT INCLUDED.